I received some mails today and found a post on techcrunch and the launcherpro blog that Google has locked down GMail so that my app email widget (and also many other apps) stopped working with it. You can find a technical explanation here. I just noticed that GMail has set the access permission to “signature”, so also rooting and installing my app as system app won’t work!! Go to the directory “download” or “downloads”. There you should find your downloaded skin file. Now the file should be moved to the right spot. 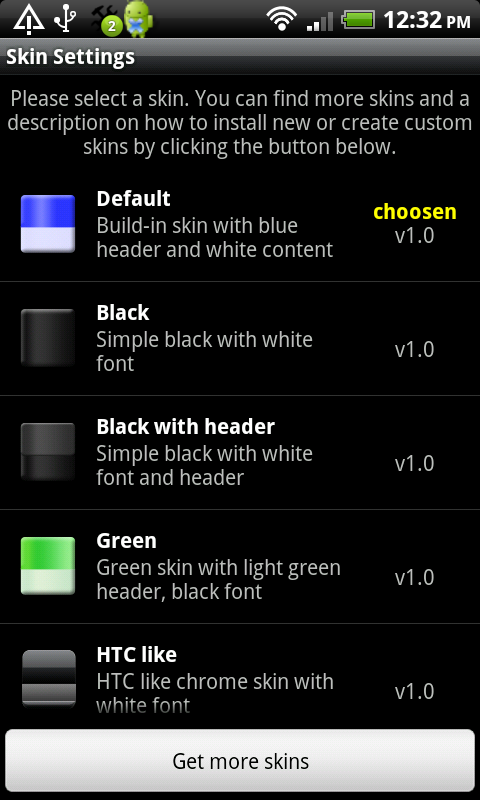 Open your widget configuration and go to the skin-settings. You should be able to choose the installed skin now. Please mind: If you have downloaded skin files successfully please make sure to not unzip/unpack them. 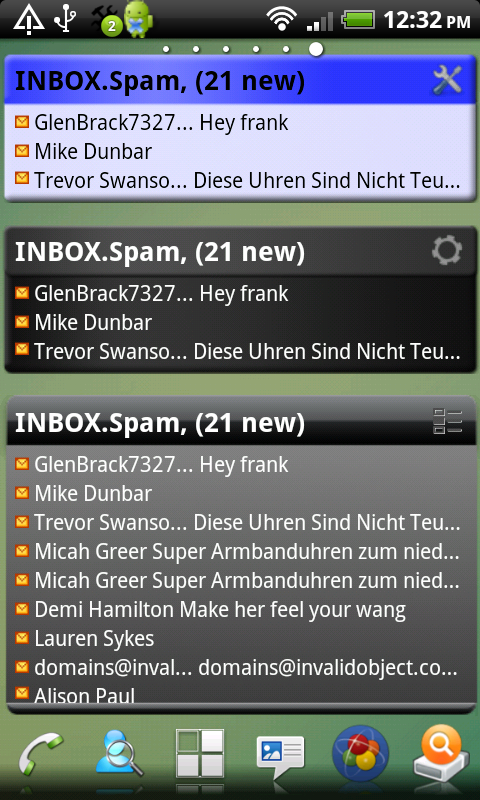 You now can get my app email widget and of course calendar event reminder as well on the AndroidPit market as well. The good thing about it is that you can now also pay with paypal and click n’ buy. 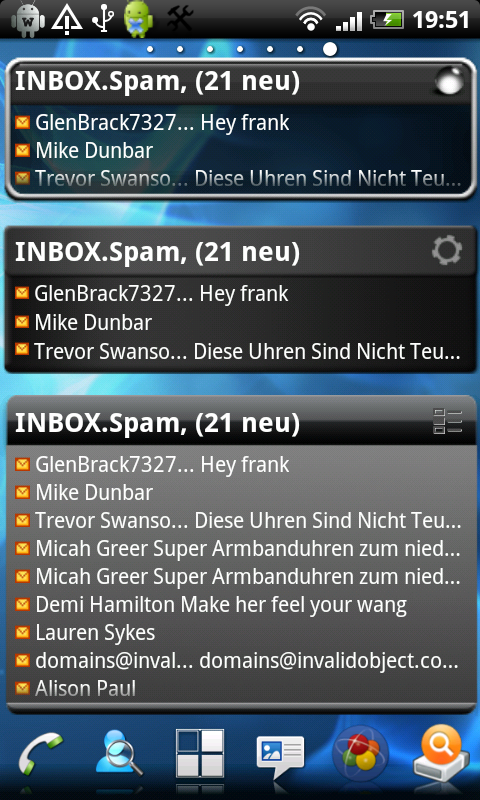 This page contains information on skins for my app android email widget. Here is a list of available skins for free download. Below are instructions on installing, updating or creating skins. If you’ve created a skin and want to share it, please get in contact with me or post a link to it in the comments down below so i can add it to this list. If you have troubles installing skin files please read this detailed trouble shooting guide! The first one was really a tough nut to crack, because the android core surprisingly doesn’t provide easy access to emails stored on the phone. You have to use a private api, which unfortunately isn’t documented at all. Also this api is secured on the latest android release, so it is impossible to get the app working without rooting the phone. Additionally the mail app seems not yet technically mature enough, so many device manufacturer like HTC are providing their own implementation of it. This made it even more difficult to build the app. Thanks to the feedback of several users i was able to improve the apps and make them more feature rich. I also created a twitter account for publishing news on recent development for the apps. You are welcome to follow me there. For “only with root” please see the description (Installing as system app) below! 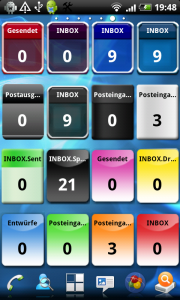 By touching the widget you can open emails (GMail only with internal viewer) or the email app. Additionally it displays a small icon to indicate wether a mail is read / unread (K9 does not support this feature). You can use it as 3x(1-4) or 4x(1-4) widget. Different widget configurations are supporte. Follow me on Twitter @invalidobject_ to get infos on recent develeopment. ATTENTION: The App doesn’t work on Android 2.2 / Froyo (except for HTC) for the build in mail app out of the box, because of the strict permission system (technical details here). You can bypass this by installing the app as a system app. For this root access is required, explanation below. You can also use K9 or Enhanced Email. GMail support only works out of the box until GMail V2.3.4.1. On the current version c.2.3.5 Google locked down GMail. Please see this post. Please feel free to contact me for any feature-requests, bugs, ideas, questions or other feedback through the comments below. If you have any problems, send me a mail with the detailed logfile (option in the app menu, file is located under /sdcard/emailwidget_log.txt) for support. If it's working, which device manufacturer do you use? PLEASE NOTE: The following is at your own risk. I will not be responsible for any damage or malfunction of your device! Please also mind, that rooting might void your warranty. 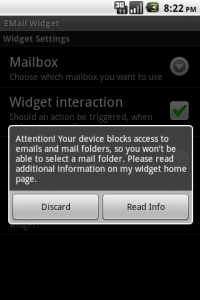 You only need to do this, if my app tells you that android has blocked access to your mails (see screenshot below). If this does not appear but you cannot choose a mail folder, then your phone stores mails in a non standard and non compatible mode. Maybe you have to restart your phone. Now you should see the app in you app-folder again. 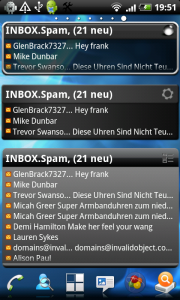 Select a mail folder now and add the widget to your homescreen. It should work now. For Froyo Users: Please see the comment below. Note: Some devices require to enable modifying the system-directory by putting the device to a mode called S-OFF. This is the case if you start your device after the steps above and the directory /system/app does not contain the emailwidget-apk. You can find information on putting your device to S-OFF here.